It started in 2013 when Mercedes-Benz presented the first CLA with its swoopy looks. We believe it isn’t long that the company managed to bring the better version of model. 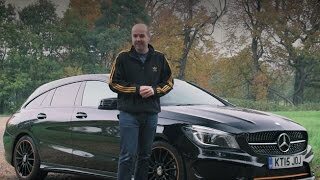 We are here today talking about the newly released Mercedes-Benz CLA Shooting Brake 2015 offering stunning looks and commendable options beneath its hood to rule your heart. 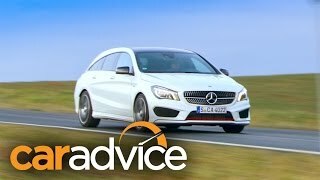 Let us have a look at the review of Mercedes-Benz CLA Shooting Brake 2015 to know more about this elegant model. The interior of Mercedes-Benz CLA Shooting Brake 2015 is elegant, luxurious and spacious a mile ahead to the extent we expected. The rear seats offer you freedom to be bent and to further enhance the cargo space. A highly advanced dashboard gets accompanied by a flat-bottom three spoke steering wheel with Mercedes logo in its center while the air vents for proper air distribution sit all across the dash covering both the ends and three being mounted over the center console and beneath the infotainment screen. The infotainment screen not only provides all vital information but also looks after the entertainment segment. Instrument cluster though carries looks resembling to other models we’ve seen in recent years but still looks gorgeous with the design pattern. The rear compartment is also fitted with a collapsible box, which includes a 12 V sockets and additional stowage net adding to comfort of your luggage. In all with all these the interior of Mercedes-Benz CLA Shooting Brake 2015 for us is best to what we need and gets commendably complemented with the exclusive ambience, anti-slip inlays and aluminum strips which comes as an option for the load compartment floor. The exterior of Mercedes-Benz CLA Shooting Brake 2015 in simple words is truly gorgeous. Starting with the front fascia of Mercedes-Benz CLA Shooting Brake you’ll notice the trademark grille with company’s logo sitting proudly amidst the wide elongated bi-xenon headlamps featuring highlighted rings around. Beneath this serenity lies three large air vents two on the sides matching the design pattern of headlamps while one in center that covers the area almost equal to grille. 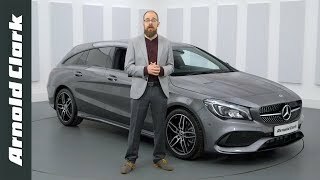 Moving to the rear end of Mercedes-Benz CLA Shooting Brake you have a swoopy body featuring muscular body through its tailgate, taillights and bumper. The special edition portrayed at the unveil ceremony offers the orange highlights making this four-door coupe look extremely beautiful. The Mercedes-Benz CLA Shooting Brake 2015 offers you five powertrain option in total, including two diesel and four petrol variants, The diesel line up works over 2.0 Liter in-line Four-cylinder engines generating total output of 136 hp and 177 hp with their peak torque being 300 nm and 350 nm respectively. Moving over to Petrol variants it has four variant namely CLA180, CLA200, CLA 250 and CLA 250 4MATIC generating 122 hp, 156 hp, 211 hp and 211 hp respectively. The rated torque figures for these variant is 200 nm, 250 nm, 350 nm and 350 nm respectively. The only difference between CLA 250 and CLA 250 4MATIC is its sportier design and sound coming through engine.